Cherry blossoms fall outside through the hazy sunlight, causing Henri’s heart to jump at the possibility. But no, it isn’t her, only halos and silhouettes from the angle of the light through the window. Having heard of Houdini’s pact with his wife for whichever one died first to come back and report of the afterlife, Mina researched spiritualism, witchcraft, religions, anything and everything to learn how to return, even practicing astral projection. Phone calls to family and friends confirmed her recall of astral visitation, shaking Henri’s paradigm with her accuracy. Her seemingly lifeless body inert on their bed, safely guarded by him, perturbed him more. Periods of separation lengthened, panic rising in his throat like bile, perils of astral projection haunting him in the interim. The last time, he waited hours and she didn’t return. By the next day, her body lay deathly still, while he sat staring in his sleep-deprived terror. Days. Weeks. Months. She looked perfect, requiring nothing, inexplicably preserved, so that he maintained his hope that she had not actually died. 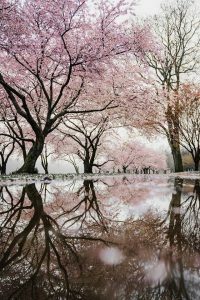 Now the cherry blossoms again taunt him with their shadows in his growing belief that he will witness somehow the return of her essence to her physical self, three years on.